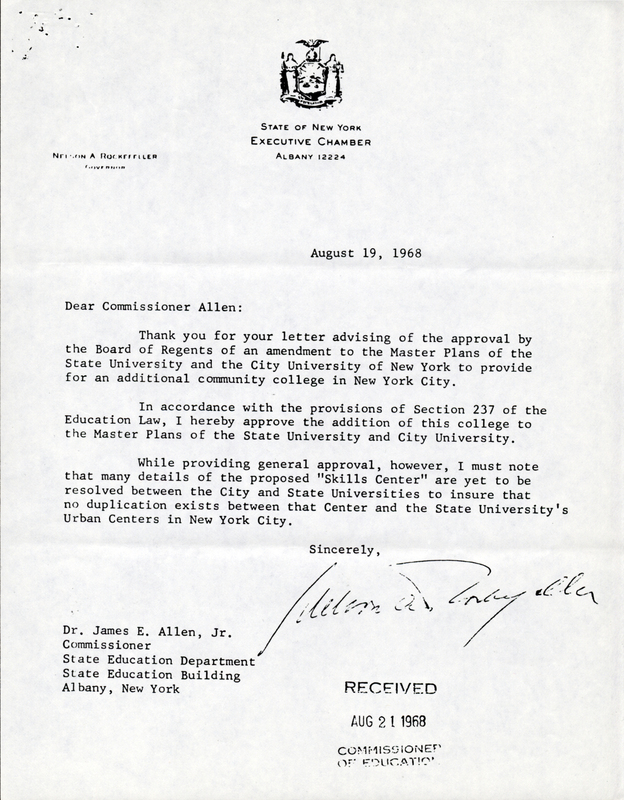 This NY State letter of approval for additional community college (# seven) is signed by Governor Nelson Rockefeller and directed to James Allen, his Commissioner of the State Education Department. He notes that it has yet to be confirmed that no duplication exists between this "Skills Center" and any other "State University's Urban Centers in New York City." Creator | Rockefeller, Governor Nelson A. Cite This document | Rockefeller, Governor Nelson A., “State Letter of Approval for additional community college (# seven),” CUNY Digital History Archive, accessed April 24, 2019, http://cdha.cuny.edu/items/show/3152.